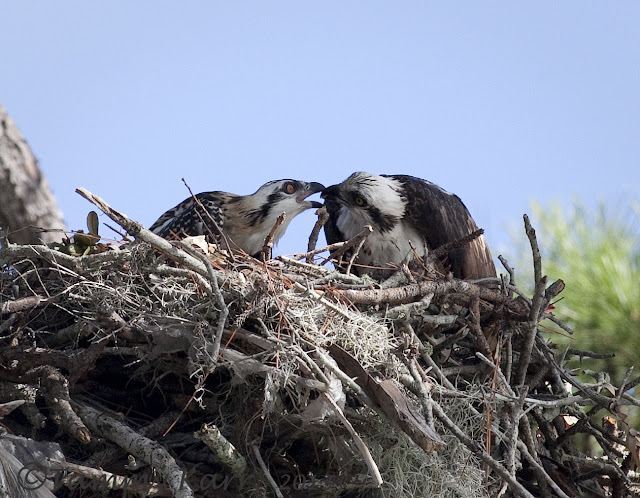 For the past three years, a pair of Ospreys have built, rebuilt, added on to, and attempted to reproduce in a hefty nest in my neighbor's large pine tree. The pair finally hatched a chick this summer! Because I can see the nest from my living room, porch, deck, yard, etc., I've been able to regularly observe their interesting interactions. 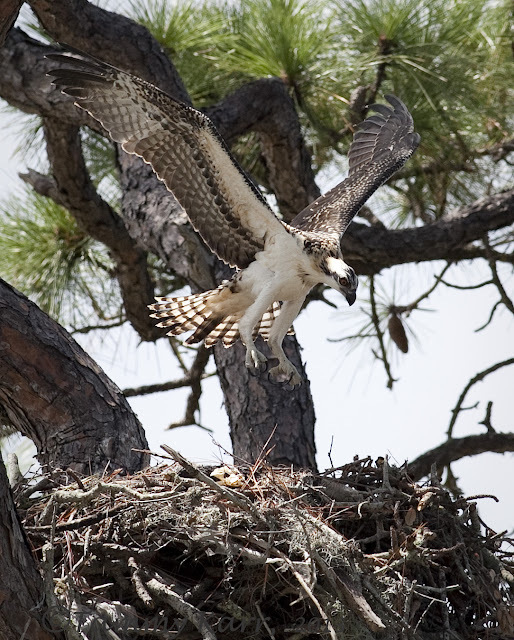 "Mama" Osprey was the primary caregiver; she spent the majority of her time protecting, shading, and feeding her chick. 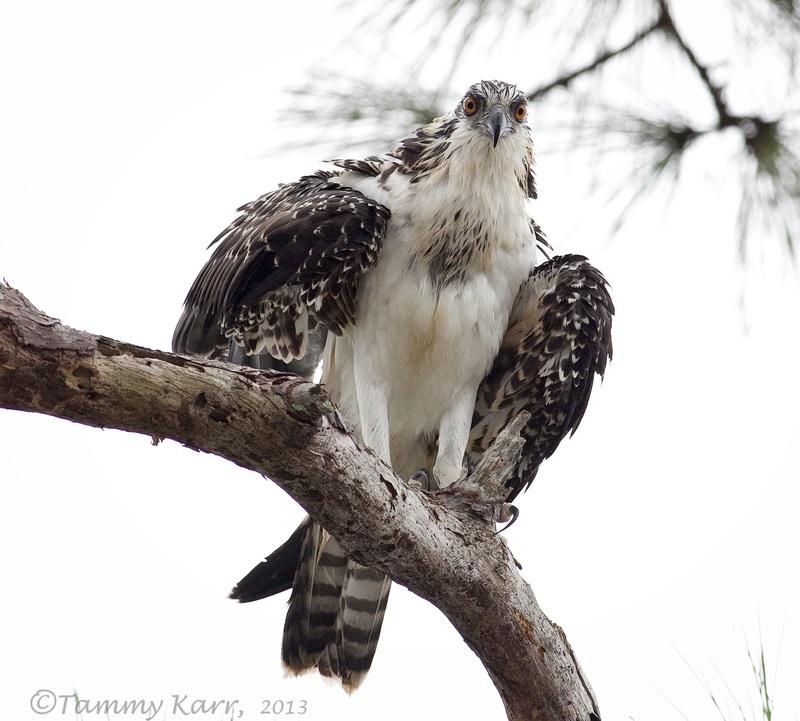 The male Osprey dropped off an occasional meal and stopped by for brief visits. 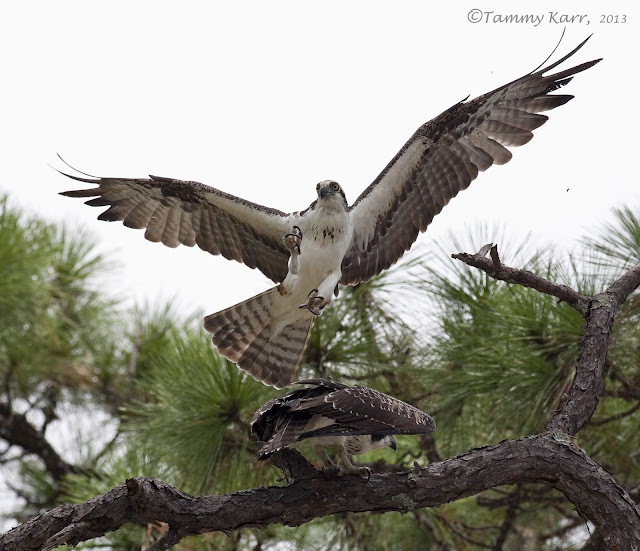 Several times a day the female Osprey would return to the nest with her fresh catch from the Indian River lagoon. As she ate, she occasionally passed small pieces to her chick. As the chick neared adult size, Mama started consuming her portion of the meal outside of the nest. I suppose she didn't want to chance her meal being overtaken by the hungry chick. 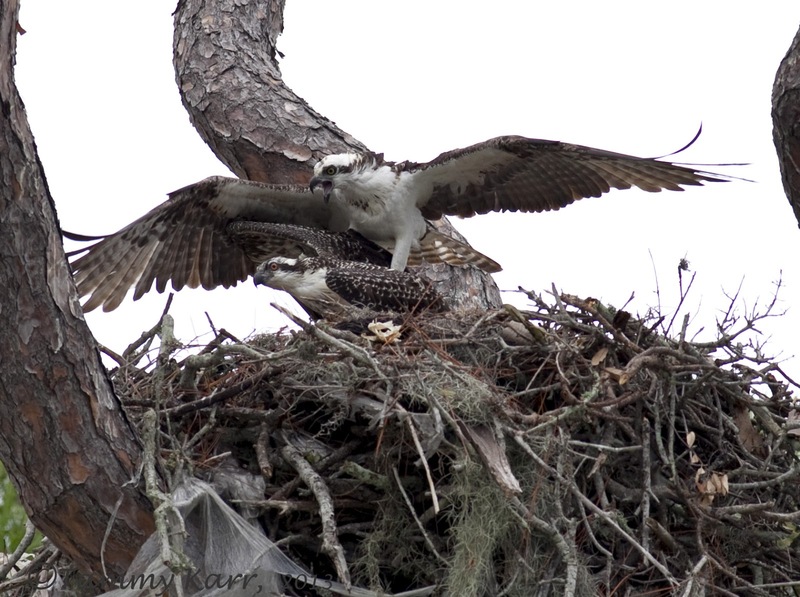 Mama may have been enticing the chick to venture out of the nest as it was nearly ready. 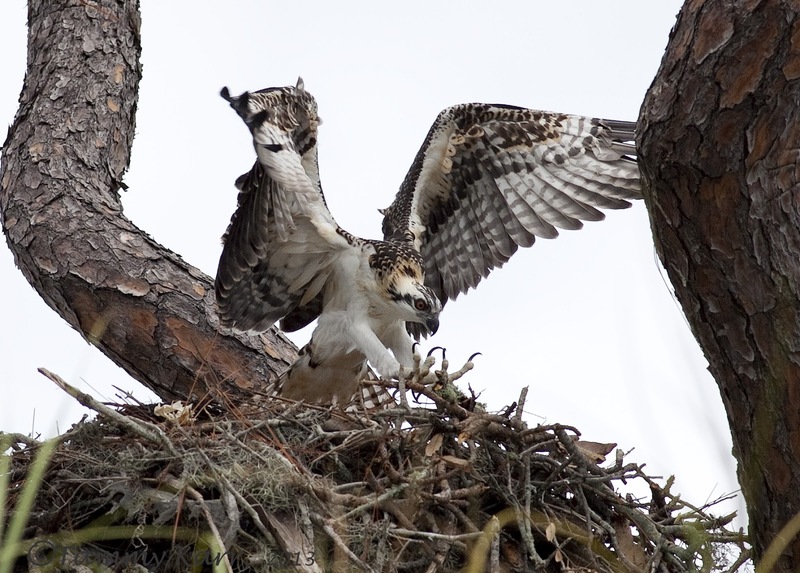 To prepare for its maiden flight, the young Osprey spent a lot of time each day exercising its wings. 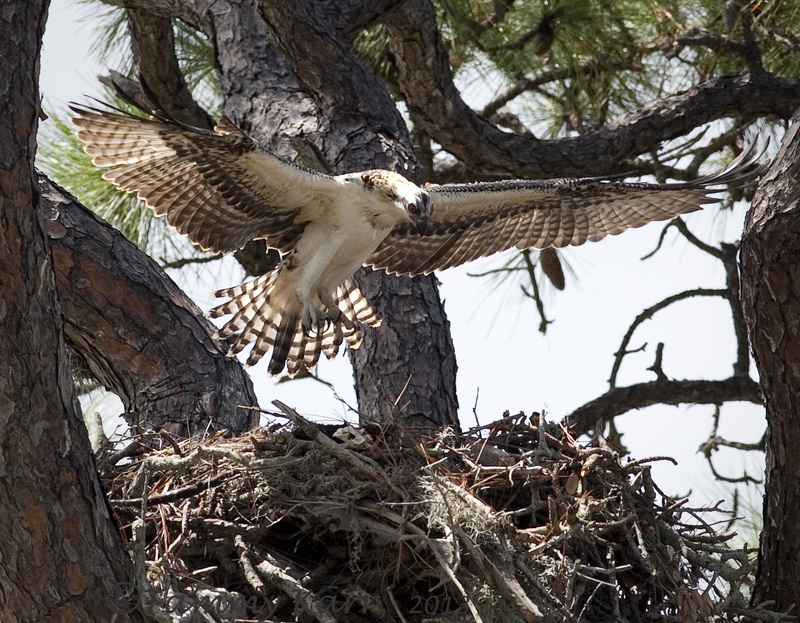 The Osprey practiced lifting off and landing, and would even hover a few feet above the nest for several minutes. Territorial disputes around the nest transpired on a regular basis. The fact that an American Crow family was also actively nesting in the tree made for some regular commotion. 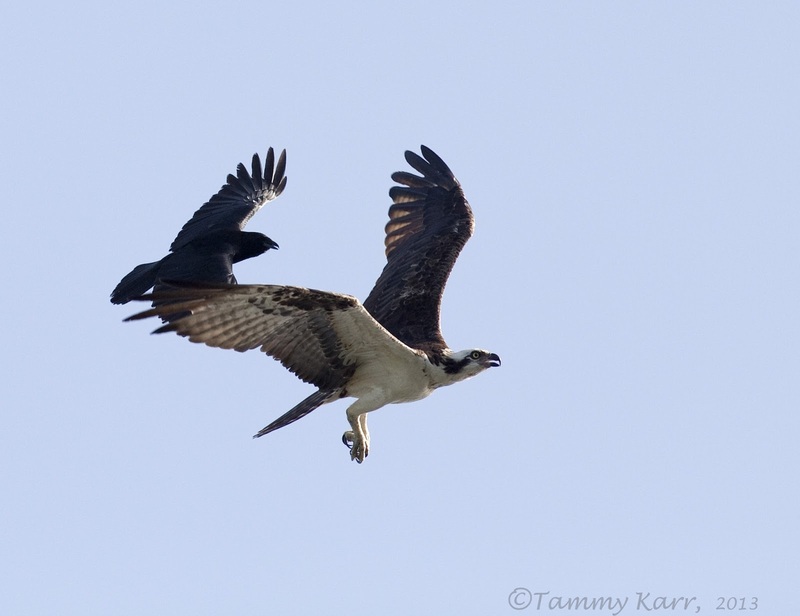 On this particular occasion the crow didn't want to let the female Osprey return to her nest. The nesting Ospreys seemed to have the most difficulty with the other Ospreys in the area.With 6 other nests nearby, there are quite a few Ospreys around. 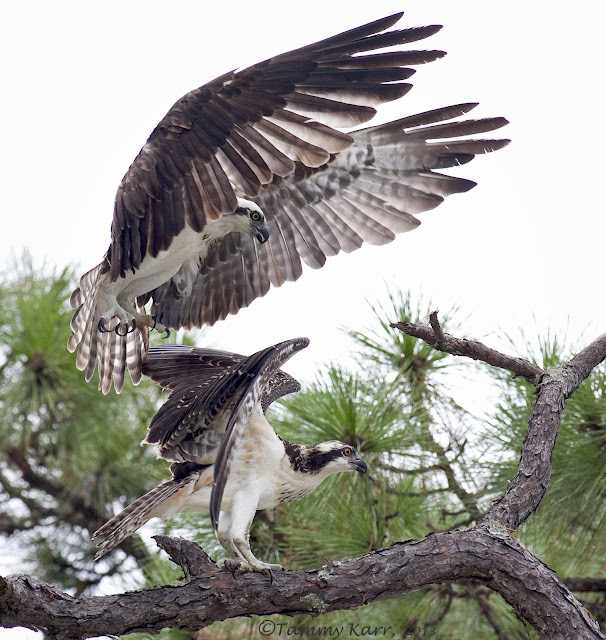 One of the most dramatic events took place one afternoon when a juvenile from another nest landed in the tree. 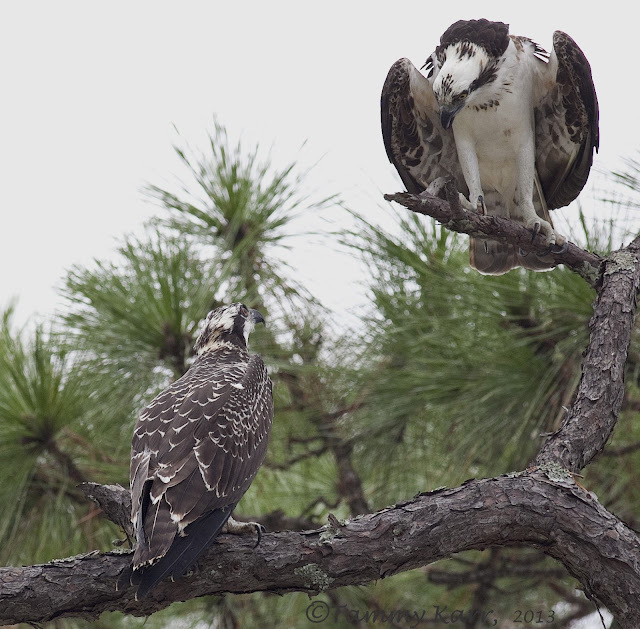 The wayward juvenile's presence was not well received by the adult female and the tension was high. 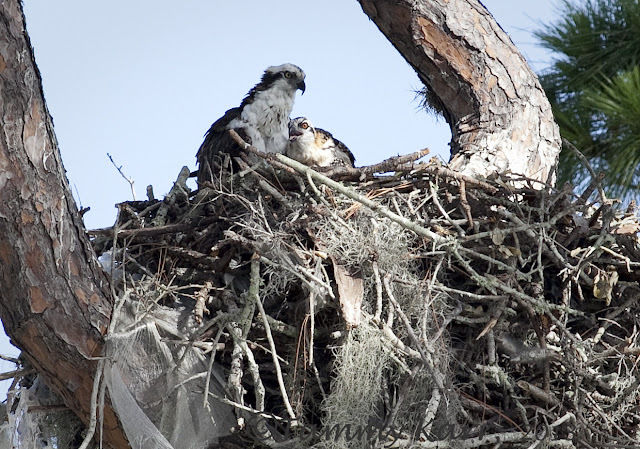 The juvenile stuck around for quite a while, even with the female's persistent attempts to get it to leave. The juvenile finally few off, only to return moments later and land in the nest. The unwelcome juvenile Osprey was held down by the female for several minutes. This time when it left, it did not return. The resident juvenile finally fledged and then it was on to fishing lessons! 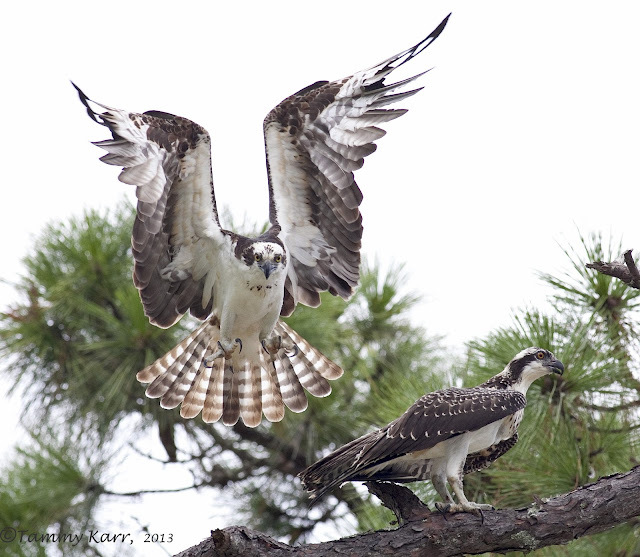 The young Osprey was still dependent on the adult for food for a few weeks but is now catching its own meals. I captured this photo of the strong and healthy juvenile just this past week! Very nice story - and what a great spot to be, to be able to watch it all unfold! Great shots, thanks for sharing. Thank you for your comments, France! Fascinating, Tammy! 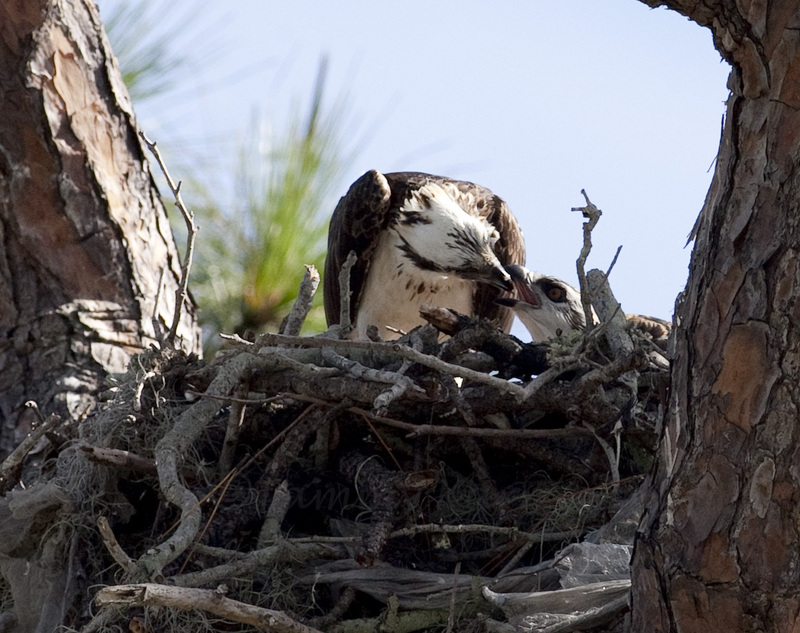 Your close-ups provide new insights into Osprey family life. Thanks, Hilke! It was fun to watch the interactions and learn more about these birds. Thank you, Terry! It was interesting to observe the family in action! An interesting series and story. I really like the photo against the white sky with those orange eyes standing out! Thank you, happy wanderer! I like the juvenile's bright orange eyes as well! Absolutely fascinating!! Great story line and astonishing pictures!! Thank you so much for sharing, even if it does make me very jealous of your opportunity!! These are incredible! I called my daughter to show her, too. She was amazed and said the photo were so clear they didn't look real!!! Wow, what an awesome view!Awesome shots of the Ospreys! Great post, Tammy! Wonderful photos - what a joy to observe this so close. 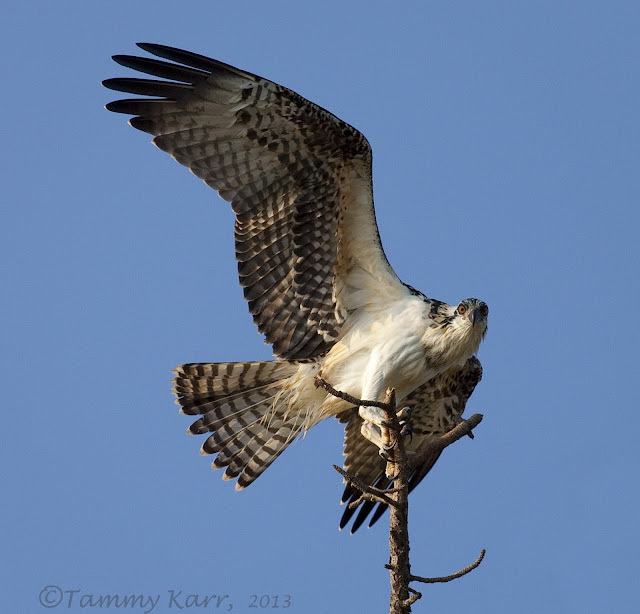 Awesome photographs and documentation, Tammy! 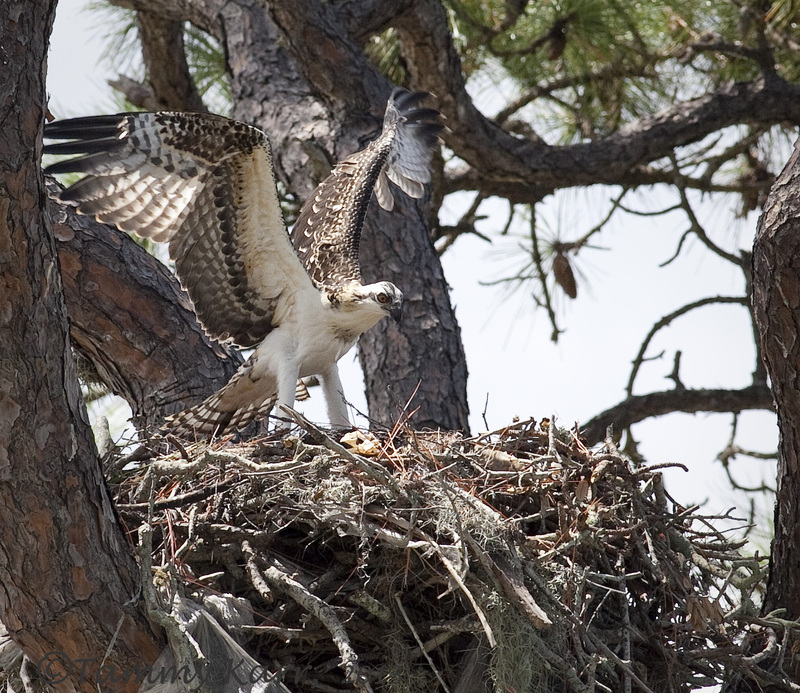 How fortunate for you that you could observe these nesting ospreys from your property. I always look forward to your fantastic posts!